Important second edition of Mercator and Hondius' Map of the Arctic showing a break with 16th century cartographic convention. This is the second edition of Gerard Mercator's map of the North Pole or Arctic, one of the great cartographer's most interesting and important maps. Mercator's Arctic projection has its roots in his magnificent 1569 wall map of the world in which Mercator first introduces his revolutionary projection. As regards the Arctic, the difficulty with the Mercator Projection is that to accurately depict the Polar Regions, his map would have to be infinitely tall. Mercator compensated for this by including a polar projection, very similar to the map shown here, in the lower-left hand corner of his great map. This may rightly be considered to be the world's first specific map of the North Pole. Mercator later reissued this map in an expanded format for his 1595 atlas. 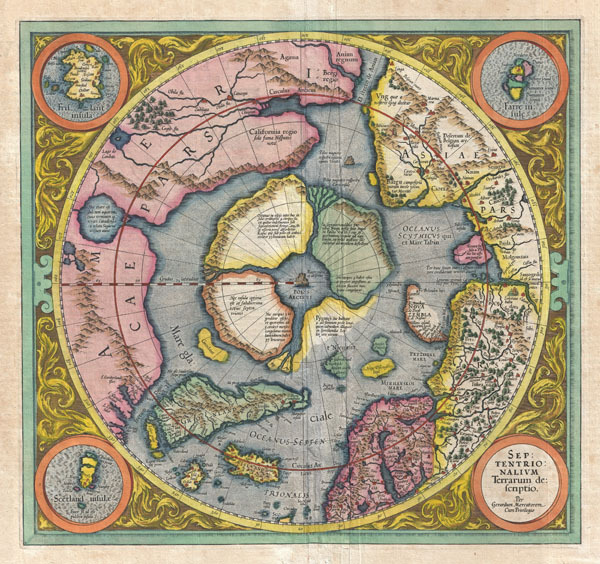 Following a number of important expeditions to the Arctic in subsequent 10 years, Mercator's successor Jodocus Hondius reissued the original 1595 map with a number of revolutionary and highly significant changes. In the midst of the four countries is a Whirl-pool, into which there empty these four indrawing Seas which divide the North. And the water rushes round and descends into the Earth just as if one were pouring it through a filter funnel. It is four degrees wide on every side of the Pole, that is to say eight degrees altogether. Except that right under the Pole there lies a bare Rock in the midst of the Sea. Its circumference is almost 33 French miles, and it is all of magnetic Stone (…) This is word for word everything that I copied out of this author years ago. The author that Mercator refers to is generally believed be Jocobus Cnoyen van Herzogenbusch who is himself referencing an enigmatic lost work, the Inventio Fortunata. Little is known of the Inventio Fortunata (Fortunate Discoveries) save that it was composed in the 14th century and was a well-known resource for cartographers of the 15th and 16th centuries. The author of this work is a figure of considerable mystery and arguments have been made that he is Nicholas of Lynn, Thomas Kingsbury, or Hugh of Ireland. The work tells of a Minorite monk from Oxford who traveled extensively in northern lands, including Iceland, Greenland, Norway, and possibly even Labrador. The Inventio Fortunata also itself references a far older and similarly lost work, the Gestae Arthuri, which adds a new chapter to the legend of King Arthur, citing that his warriors conquered Iceland, Greenland, the Faeroes, and parts of Norway. Regardless of the attribution of Mercator's sources, the idea of the Arctic being divided into four lands surrounding a black magnetic rock was, even in the 16th century, not new. Variants on the magnetic rock theme, the Rupes Nigra, can be found in such esteemed references such as the texts of Ptolemy, which identifies several such. The presence of such a magnetic mountain at the extreme north may have seemed a natural connection for scholars attempting to explain the wonders of the compass. Curiously, though referencing the Inventio Fortunata with regard to the presence of the Rupes Nigra at the Arctic Pole, Mercator does not ascribe to it any magnetic property. This he reserves for another magnetic rock located north of the Straight of Anian, which he here identifies as the magnetic pole - possibly an attempt to account for magnetic variation? It is hard to know exactly what these navigators witnessed, but there can be no doubt that Arctic currents in Davis's Strait are powerful and erratic. One of the large polar islands, located north of Norway, Mercator claims is the home to a band of female Pygmies. This too references the old English voyages described in the Inventio Fortunata. The author of the Inventio Fortunata seems quite clear that no vessel could survive the Polar Rivers or the great maelstrom, so any hope to accurately describe the region can be but speculative. Nevertheless, here we have a reference that is suggestive of an actual voyage to the region. The female Pygmies may well be a reference to Lapland Eskimos who are quite small in stature. That the group was predominantly female is consistent with Eskimo hunting patterns in which the men will often leave in groups to hunt. Mercator's original map from his 1569 wall map, as well as the first edition of his atlas map of the Arctic, published in 1595, shows four complete islands with a solid coastline. This edition marks a significant leap forward in Arctic cartography. Mercator completed his 1595 map just before he died in 1594. Two years later the Dutchmen Barentz, in search of a northwest passage, discovered Spitsbergen and rounded the northern tip of Nova Zembla. This incredible achievement redefined the cartographic perspective of the region, for the newly discovered islands were well into the latitudes where Mercator had mapped his four Arctic countries. In this 1606 example, Mercator's heir, Jodocus Hondius, had to redraw Mercator's 1595 map to account for the Dutch discoveries in Spitsbergen and Nova Zembla. Attempting to reconcile recent discoveries with a century of cosmographical convention, Hondius erased part of the 'Pygmei' island and instead added Nieulant, Willoughbbe's Land and MacFin - alternate names for the islands of Spitsbergen. What Hondius thus creates is a map that embraces two realities, both of which cannot exist simultaneously. The first is the old world four island notion embraced by Mercator and the second is a modern world newly discovered. Other maps of this region would, in the subsequent decades, follow suit until, by about 1636, all trace of Mercator's four countries, the Rupes Nigra, and the Arctic maelstrom had vanished. The intriguing elements of Mercator and Hondius' map do not end with the North Pole. The mythical island of Frisland, which appears between Greenland and Iceland, is one such example. Here both the configuration of Greenland and the existence of Frisland are drawn from the Zeno Map, composed by the Venetian explorers Nicolo and Antonio Zeno. The brothers Zeno explored the coasts of Greenland in the 14th century. Some have suggested that they continued west of Greenland to land on Newfoundland, thus advocating a Venetian discovery of America. This idea has largely been discredited. However, it seems certain that they did land on the western shores of Greenland and upon their return landed in Iceland which they subsequently mapped twice, once as Frisland and once properly as Iceland. Frisland continued to appear on maps of this region well into the 16th century. Mercator's interesting mapping of North America in the left hand quadrants of this map is also of exceptional interest. There are no significant changes in Hondius' 1606 treatment of the northern parts of America over Mercators 1595 treatment; however, there are significant differences between the 1595 map and the 1569 inset map, which left the region blank. One can only assume that Mercator must have come across new information regarding the northern part of the Americas in the intervening years. One such example is the 'Lago de Conibaz', a large lake, with a central island that has an outlet into a great Arctic Bay to the northeast of the Straight of Anian. Conibas appeared on a number of earlier maps including its first appearance on the Thevet Map of 1575. Thevet is known to have met with Cartier and may have derived the lake from these conversations. Some suggest that the term refers to 'Cornibotz', an alternate name for Wampum shells. In any case, this lake has been associated by some scholars with Great Salt Lake, Lake Ontario, the Great Lakes in general, and some of the other large Canadian lakes. Whatever it may be - and there is a great deal of mystery here - it does suggest that European cartographers had some sense of the great inland lakes of North America long before their official discovery. Mercator also, curiously, places California north of the Strait of Anian. The source of this decision is unclear. In earlier maps Mercator names this region 'Bergi Regio'. In most other maps of the period California is properly located around modern day Baja California - where it was originally identified. Thus Mercator’s positioning of California is exceptionally curious. Mercator did everything for a reason and consequently we can speculate. California at this time was not 'California' as we understand it today. The name 'California' comes from a c. 1475 Spanish novel, Las Sergas de Esplandian (The Adventures of Esplandian) by Garci Rodríguez de Montalvo. Montalvo describes an island 'East of the Indies' inhabited by Amazons. It was Cortez who first to attached the name California to a physical location - modern day Baja. This must have happened around 1540. Cortez at the time was searching for the Strait of Anian, the imaginary equivalent to the Bering Strait. The first mention of Anian appears in Polo's narratives, which describe it much as Montalvo descries California, as 'a place to the east of India'. This India is not modern India, but rather a term that refers to farthest Asia - China, Japan, Korea, etc. In the 16th century the line between nonfiction and fiction was not so clear as today. Cortez and the other conquistadores would have been aware of Montalvo's work, but would not necessarily have considered it entirely fictional. That is to say, they expected to discover California. Keep in mind, in those days the navigators did not believe that Asia was far beyond Mexico. By 'discovering' California in Baja, Cortez in fact believed he had at last stumbled upon Anian and a route to Asia. Thirty years later Mercator had probably figured out that Cortez's claims were baseless but the name Cortez applied to Baja stuck. Mercator himself identifies Baja as California in some of his charts of Mexico. So, why did he also place it in the Arctic? I think that here Mercator was looking for the 'true' California. It was obvious that the California of Cortez was a fiction, but that did not mean that Montalvo's idea of California was wrong, only that it has been misplaced. By attaching California to the Strait of Anian - also located to the east of Asia - Mercator was most likely working out the true placement of Montalvo's California. Opposite the American side of the Strait of Anian, is the Asian land of Gog, which appears bound in a tight ring of mountains. Gog and Magog, Biblical nations from the Book of Revelations, were associated by many Europeans with the Tartars. It was believed that Alexander the Great walled off the Kingdom of Gog and Magog behind a mountain range. Many early maps, following up on this legend as well as references from the journals of Marco Polo, place either Gog or Magog in the northeastern extreme of Asia behind an impenetrable mountain range. Mercator, G. and Hondius, J, Atlas, 1606. Mercator's Atlas is one of the most important works in the history of cartography. Although in fact Ortelius was the first to publish a proper atlas, the Teatrum Orbis Terrarum, Mercator's Atlas the first book to employ the term Atlas for a collection of maps. The term is derived both from the mythical titan, Atlas, who was forced to bear the world upon his shoulders, and the Libyan king, philosopher, and astronomer of the same name that, so the legend goes, constructed the first globe. Mercator dedicated the final 25 years of his life to compile the Atlas. He published two parts during his lifetime in 1585 and 1589, but the final part published posthumously by his son Rumold Mercator, in 1595. The map plates for the Atlas were later acquired by Jodocus Hondius who published the most complete and well known edition in 1606. It was Jodocus who popularized the Atlas and did the most to popularize the name Gerard Mercator. Very good. Wide margins (3 - 4 inches) all around. Small chip from upper margin. Original centerfold. Another minor crease running parallel with the centerfold about 1 inch to its right. Original color. Else clean. Text on verso. OCLC: 898431950. Taylor, E.G.R. (1956). 'A Letter Dated 1577 from Mercator to John Dee', Imago Mundi 13: 56–68. Van der Krogt, P. C. J., Koeman's Atlantes Neerlandici, 0020:1A. Burden, P., The Mapping of North America: A List of Printed Maps, 1511-1670, 88. Verner, Coolie and Stuart-Stubbs, B., The North Part of America, p. 142-187. National Library of Australia, 1628 MAP RM 150. Ginsberg, William B., Printed Maps of Scandinavia and the Arctic, 1482-1601, 33.3. Kershaw, K., Early Printed Maps of Canada, 23C. Costa, B. F., 'Arctic Exploration', Journal of the American Geographical Society of New York, Vol 12, p. 159-192. Pool, J., 'Spitsbergen: Early Exploration and Mapping', IMCOS Journal, vol 121, 35-42.